Battier, coming off a fourth-place finish in the Smarty Jones Stakes, ran third in yesterday’s $1 million Grade II Pennsylvania Derby at Parx, in Philadelphia. He earned $111,200 for the effort. Finishing 2 3/4 lengths behind winner Will Take Charge, and a neck short of second-place Moreno — each of whom is ranked among the top 3YO colts in the country this year — Battier looked like a possible winner driving down the stretch, but fell just short. We were thrilled, to say the least. Next race will probably be a Grade III Stakes at Aqueduct six weeks from now, but plans are fluid. In Lingerie is due to enter the Keeneland sales ring in November, where she will be sold in foal to Frankel. Connections say she looks fabulous and are excited by sale prices at the recent Keeneland yearling sale. Here she is in a photo taken last week. State of Play did not draw into his Stakes race at Laurel Park yesterday, and now is planned to go in a one-mile allowance on turf October 5th at Laurel. Bee Brave is said to be progressing nicely, but not in fitness shape for racing just yet, as you can see from this photo. Bajan had a very nice work last week, going 35 and change over 3 furlongs. 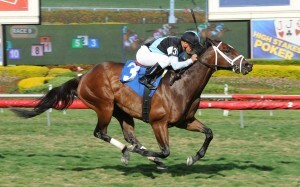 She is planning to run October 13 at Santa Anita in the $70,000 Anoakia Stakes on dirt, at 6 furlongs, if all goes well. Everything looking good, so far. Since the last update, two horses have run, with mixed results. Two-year-old filly Bajan ran in the Del Mar Debutante Derby, a $300,000 G1 last Saturday , August 31. She finished 6th, and her jockey Victor Espinosa — who has been aboard for all three of her races — reported that she unexpectedly broke in to a lather of a sweat before entering the gate. She was never a factor in the race, but the management team seems to view it as an anomalous “fugataboudit”! We shall see. In any event she came out of the race in good condition, and future races are under consideration. Seasoned observers beyond our connections still have confidence in her. Battier, our 3-year-old colt — named after Duke basketball player Shane Battier — ran the following Monday, September 2, at Parx racetrack near Philadelphia, in the G3 Smarty Jones Stakes for $350,000. After falling far back entering the first turn, he rallied nicely, but went 6-wide around the 2nd turn, and had only enough in the tank for a fourth-place finish. He earned $21,500 for the effort and pleased our connections enough that they are looking at the September 21 Pennsylvania Derby for $1million. The race is also at Parx, a track Battier seems very comfortable running. This race was more encouraging than it first seemed, as jockey inexperience — a common villain in horse disappointment — was blamed with some apparent justification. 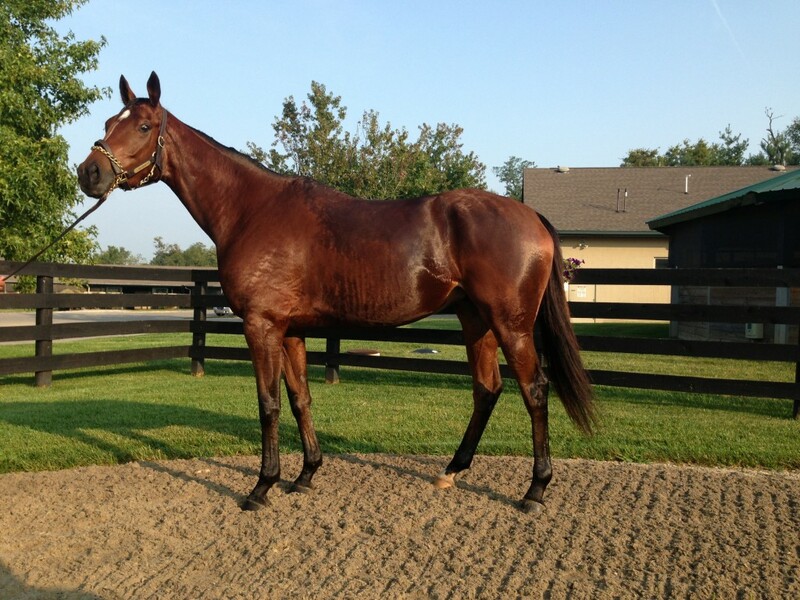 Bee Brave, a 3-year-old filly who has been on the shelf since arriving from England as a heralded 2-year-old, finally appears to be healthy, and is in training in Lexington, KY. She has never run in the US, and sending her to California from Europe now seems to have been an unwise move in retrospect. Being a Kentuckian, I can understand, never having been really comfortable in California. Looking forward to seeing her race in 2013. State of Play is in serious training at Fair Hill, where Barry Irwin continues to tout TVI sole trainer Rick Mettee as the second coming of Ben Jones. Not our affair. Geh gesundte heh! 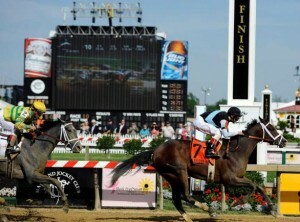 According to notes released, State of Play is expected to be ready to run at Laurel in Maryland this month. And last . . . In Lingerie, healthily in foal to Frankel, will be sold at the Keeneland Broodmare Sales in November. HUGE expectations! At least from Laurie and Gerry. Since our last update last December, there have been significant changes in our ownership interests and status of currently owned horses. We claimed a half-brother of Pluck named Southern Heart, who turned out not to want to pursue a career in racing and was retired after three lackluster efforts. He is currently in Law School at Stetson, wherever that is. Vapour Musing, who won her last two races, developed ankle problems late last year and never raced again. It was felt she was likely to break down, and a good home was found for her. Matagot, a horse for whom we held some expectations, was a non-winner and retired. Bee Brave, a European filly who had a promising start in England, has been snake-bit from the start after being shipped to the US after purchase, with one ailment after another. (Laurie thinks she didn’t like the smog in Los Angeles.) She has not run here since being shipped from England. She now appears to be injury-free and happy in the east, and at last notice should resume training this fall. We own shares in her in partnership with son Phil. In Lingerie was successfully bred to Frankel in England in April, subsequently shipped back to Lexington, KY, this spring, and is being groomed and pampered in anticipation of her sale in foal at the Keeneland sales this November. Frankel was the most sought-after sire in the world this spring, after being called the greatest horse of the past century. (That is, 100 years, not 13). Sale expectations are running rampant — at least in Laurie’s imagination — and she expects we will be able to retire some time after the sale. State of Play also experienced health problems after his disappointing run in the 2011 Breeders’ Cup Juvenile Turf. He ran first in a March 2012 race, then third in an April 2012 race, but has not run since. He was declared fit again about three months ago and has been returned to training, where he is now breezing 5 furlongs in good style. 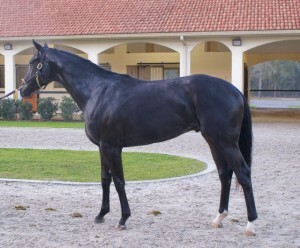 Management still has confidence in him, both as a racehorse and a breeding stallion. We shall see. They anticipate a September return to racing. 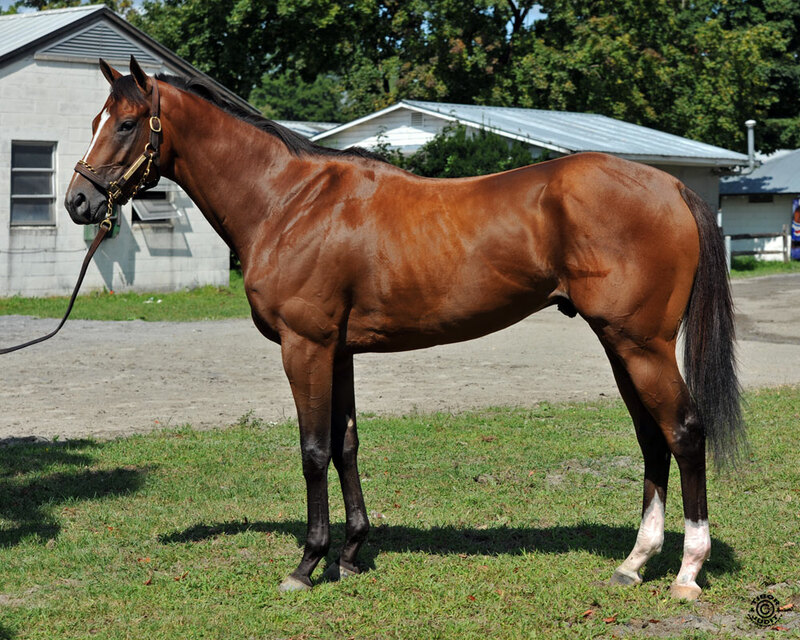 New acquisition Battier, May 2013, had never run out of the money in 5 previous races prior to our purchasing him, and has two third place finishes in three starts in stakes races, including a G2. His only stinker was a 6th place finish in a G2. He appears to be back on track and is poised for a $350,000 G2 at Parx on Sept 2. And last, we bought into Bajan, a 2yo filly, after seeing her acquired at the Ocala Breeder’s Sales ring for $80,000 this May. ( Top price paid for any filly in the sale was $800,000.) She ran second in a $52,000 maiden race against colts in her debut, then came back to break her maiden for $75,000 at Del Mar last time out, beating some highly heralded fillies, including the Ocala $800,000 buy. 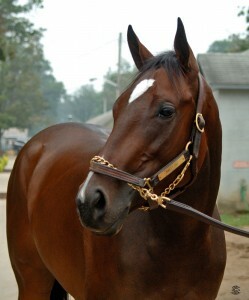 She will go in the Del Mar Debutante Stakes, a G1 $300,000 race. Exciting prospects through the late summer and fall. More later! In Lingerie was retired from racing and will be bred to to European Champion Frankel. She is expected to be sold in foal next November. 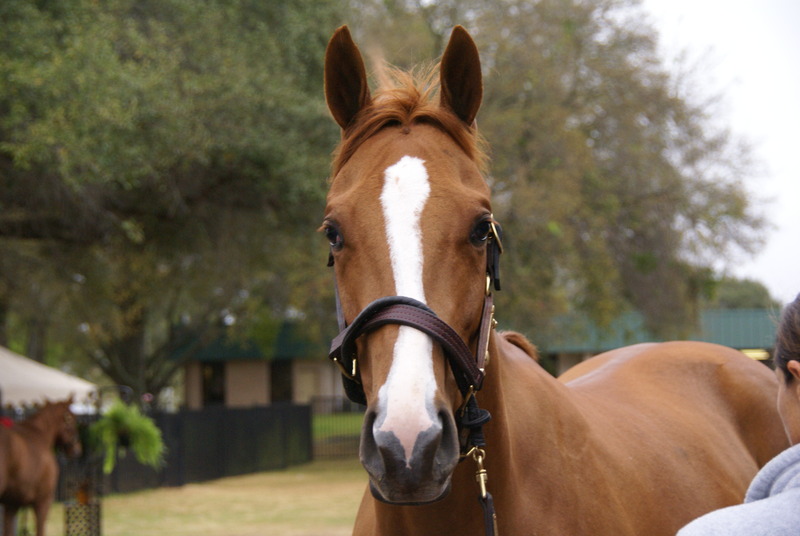 Sweet Cat was sold at auction in November at the Fasig-Tipton Broodmare sales for $260,000. Fifth Gear, a son of Leroidesanimaux — Animal Kingdom’s sire — was retired after two races without placing, and having chronic breathing problems, was given to the trainer-father of a TVI staff member for care. State of Play, a War Front colt, encountered numerous physical problems during his three-year-old campaign and is being given time off until spring, when he is expected to resume training and racing. Vapour Musing is spending the winter in South Carolina after winning twice in three starts as a three-year-old. We are waiting to hear whether management has enough confidence in her to pursue a 2013 campaign. She is a tall grey filly, and our own view is that she is a late bloomer just growing into her size; and we hope that she has the opportunity to show her improvement at four. Matagot, a two-year-old colt with good breeding, is still “green” after two races this year, but is in training with Todd Pletcher in Florida and is expected to race at Gulfstream this winter. The jury is still out. Bee Brave, a two-year-old English filly with an impressive maiden win in England, is in training in California and expected to be a stakes contender during her three-year-old campaign in 2013. Southern Heart (a half brother to Pluck, our 2010 Breeders’ Cup Juvenile Turf champion), whose father is Arch — a sire commanding a stud fee of $40,000 this year — has run three times in maiden races without a win and was claimed by Eclipse Thoroughbred Partners this week for $20,000 at Santa Anita. ETP has high expectations for this three-year-old colt after gelding him and turning him over to trainer Paddy Gallagher in California. This beautiful black colt looks very much like Pluck, and we were delighted to be given the opportunity to share in his ownership. This was our first experience claiming a horse in a claiming race, and it was pretty exciting — but not as exciting as if we’d actually been there with the halter in our hand at the finish line. If you watched the short-lived HBO series “Luck,” you might have seen the episode where some totally incompetent guys managed to put in a claim on a horse, but it was very realistic. The first weekend in November, we were in Los Angeles to see In Lingerie make her first foray on the grass in the Breeders’ Cup Filly and Mare Turf. Her win in the Spinster at Keeneland had given her a free pass to either the Ladies’ Classic or any other race with a purse of $2 million or less. Our managing partner and In Lingerie’s trainer spent a lot of time deciding which race would give her the best opportunity, and they eventually came down on the side of the turf race, although she had never raced on the grass before. She had performed well on both dirt and polytrack, and horses with that versatility can often do equally well on turf. The deciding factor, we think, was the presence in the Ladies’ Classic of some of the best fillies now running, including the powerhouse Royal Delta (who won impressively, as it turned out). 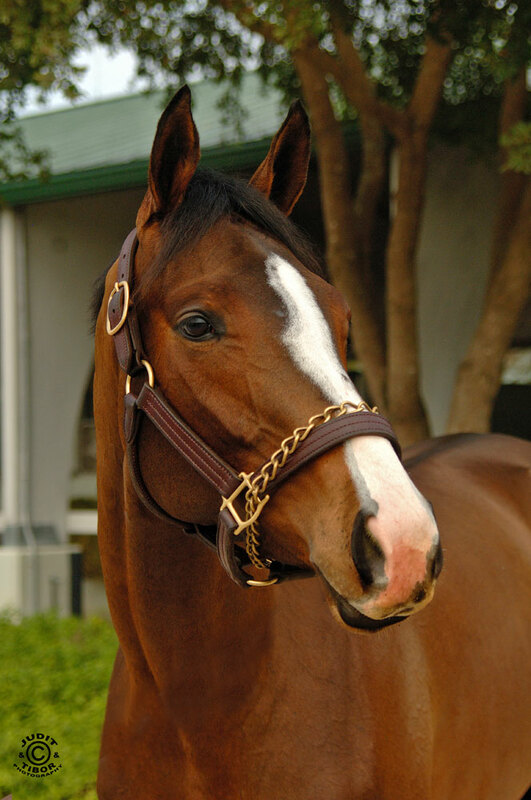 After briefly considering a 2013 racing career for her, the partnership was given a once-in-a-lifetime opportunity: In Lingerie will go to England early in the new year to be bred to Frankel, the two-time European Horse of the Year and possibly the greatest horse any of us will see in our lifetime. This will be his first year at stud, and our filly is one of only five U.S. never-bred fillies to be chosen for breeding to him. We are very excited about this and of course eager to see the foal that In Lingerie produces in 2014. The plan is to sell her in foal next November, but we hope the new owner will send us pictures of mother and baby for this web site. 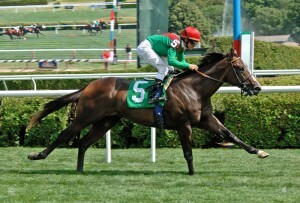 As promised, here are some photos from In Lingerie’s commanding win in the Spinster Stakes at Keeneland. This afternoon at Keeneland in Lexington, Kentucky, our three-year-old filly In Lingerie won the Grade I Juddmonte Spinster Stakes in impressive fashion with a perfect ride by John Velazquez, the best jockey in America. 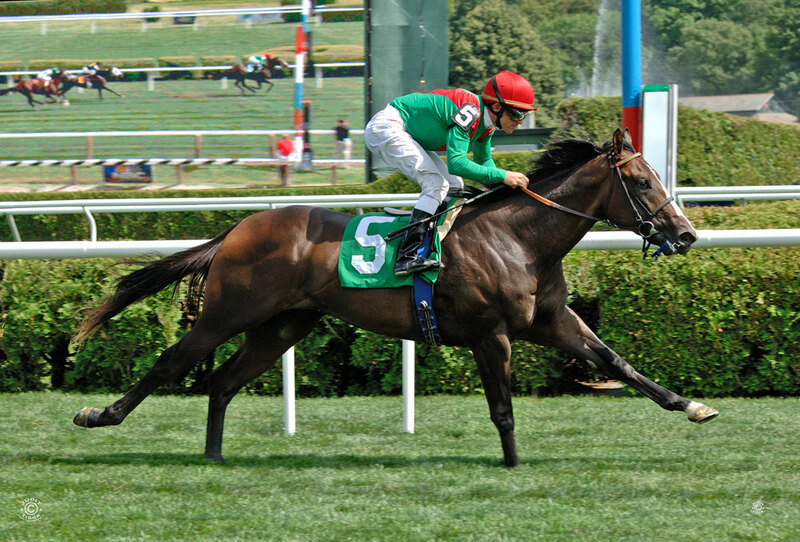 In a field that included the 2011 winner of this race, Aruna, plus a number of other top fillies, our girl proved that she has what it takes to win a major stakes race by a considerable distance and finish with plenty of gas in the tank. The best thing about this race, as opposed to other graded stakes races that might pay more in purse money, is that it was a “Win and You’re In” race for the Ladies Classic at this year’s Breeders’ Cup at Santa Anita in California. Since we were already scheduled to be on the West Coast in late October to visit family, we’ll just alter our return date to allow us to fly to Los Angeles to watch In Lingerie run. When we have photos of her win, we’ll post them on the blog. Meanwhile, please join us in raising a glass to our special filly! Much to report since our last racing update in late August. Vapour Musing showed some promise this fall, winning an allowance race at Parx (Philadelphia) on September 11. 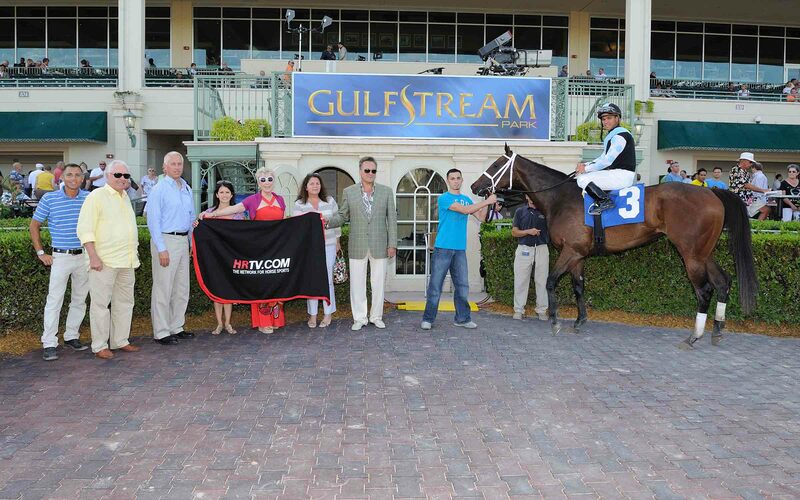 She earned $28,200 for the win, on the turf, by 1 1/2 lengths. Her next outing has not yet been decided by management, but the big three-year-old filly seems to be maturing into a race horse, after an awkward early career. She is tall and dark grey and beautiful, and we hope that she will continue to grow into her size and pedigree. Her sire is Manduro, a great German turf horse, and her grandsire was the legendary Monsun, who died just a couple of weeks ago. 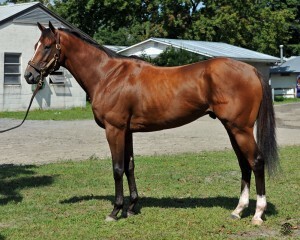 The following day Sweet Cat finished second, 2 1/2 lengths behind the winner, in the Smart ‘N’ Fancy Stakes at Belmont. She went off the 4th choice at 5-1 in the 6-furlong sprint on the turf, earning $16,000 of the $80,000 total purse for the effort. She came out of the race well and is back in training. Our connections are looking to try her on Polyturf (an artificial surface, much like grass), possibly at Keeneland in Lexington in the 7-furlong Grade II $250,000 Lexus Raven Run on October 20. In Lingerie, Eclipse Thoroughbred Partners’ marquee filly, has been training well since her last race, where she finished second to Questing in the Alabama Stakes. Questing went on to finish a very close second to My Miss Aurelia — the undefeated four-year-old super-filly — in the $1,000,000 Cotillion Stakes at Parx this past Saturday. So, as you can see, we’re in tough company. The goal and strategy is to get In Lingerie a Grade I win prior to the Breeders’ Cup Ladies Classic November 2. Now that those two “monster horses” have run their BC final prep, our trainer, Todd Pletcher, and our CEO, Aron Wellman, are looking toward either the Grade I $600,000 Beldame Stakes at Belmont this Saturday or the Grade I $500,000 Spinster Stakes at Keeneland on October 7. We’ll let you know when the decision has been made. And finally, on a sadder note: Fifth Gear, our two-year-old colt, partnered with son Philip in a Team Valor syndicate, has been retired after yet another tendon problem, along with breathing difficulties which have surfaced from time to time. Management made the decision to pull the plug on his racing career. A son of Le Roi des Animaux, as is Animal Kingdom, the winner of the 2010 Kentucky Derby, Fifth Gear showed great promise during training but developed problems beginning with his first race. A good home has been found for him with a retired trainer, and he should enjoy a comfortable life of leisure. Such are the fortunes of thoroughbred racing, for horse and owners, for better or worse! Anyone who is a real fan of horse racing ought to go to Newmarket, not only for the races, but for the atmosphere that’s so thick you can hardly see through it. We’d had Newmarket on our wish list for years, but finally our wishes and the timing of our visit to England coincided, and we started making plans months before we left home. Our friends Sally and Jack McGill, formerly of Sarasota, now live in Norwich, so we decided to take the last week of our stay in England and travel to East Anglia to see them and that beautiful part of the country. They had never been to the races, so we bought tickets for the July 28 race meet at Newmarket for the four of us via the internet from home with a click of a mouse, quite a change from our first ticket-buying experience for Royal Ascot five years earlier. Then, in order to get tickets for the Royal Enclosure on Ladies’ Day, we had to go through the U.S. State Department and submit a detailed application, together with a letter of reference from a public official who knew us personally. Luckily, one of my good friends from my time in Oregon was the former Chief Justice of the Oregon Supreme Court, and he was delighted to write a letter certifying that we were respectable citizens and unlikely to embarrass the United States in front of the Queen. For Newmarket, we only had to read the dress code for the Premier Enclosure (nice afternoon attire, hats encouraged but not required, no shorts, sneakers, torn jeans, or other unacceptable clothing choices) and decide whether or not we wanted to reserve places in the prix fixe restaurant or dine a la carte. Because it rained during so much of our time in England, we hadn’t really taken advantage of our beautiful woodland setting. But our last Monday in West Sussex, Clive the woodsman gave us a walking tour of the woods and showed us why he is so valuable to Pom and her woodland skills program. He knows every plant and tree, every clearing and trail, and he can make a “living” fence simply by partially cutting through a tree branch and bending it into place, where it continues to grow. He built a charcoal burner and makes charcoal every year, just as the people did in those woods six hundred years ago. 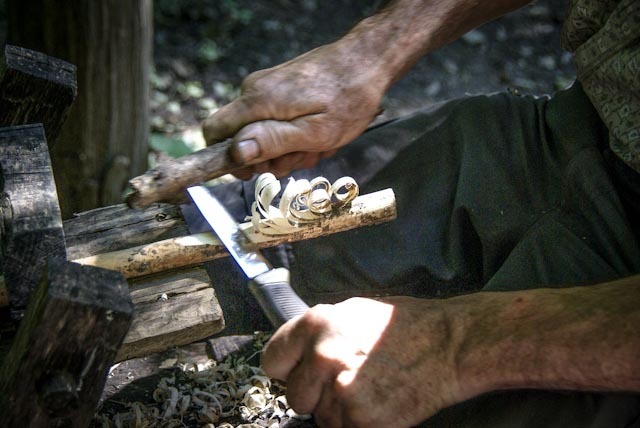 He has more woodcraft skills than we knew existed, using tools he fashions himself. If we were ever in a nuclear holocaust, I’d want Clive to teach me how to survive and take care of myself. He is truly amazing. 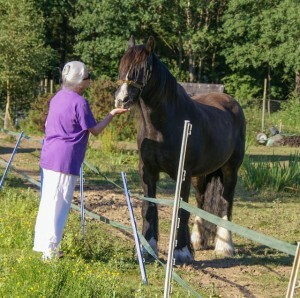 I gave William, the Irish cob, his daily treat the evening before we left Keeper’s Cottage after our five weeks’ stay. He had become very friendly by then, and we knew we would miss him. It felt strange to drive down the dirt lane from the house the next morning for the last time, not sure when or if we would ever return, but we took only good memories with us. The weather, of course, was beautiful that day, as if to remind us that the summer’s rain had been all our fault. We’d told the staff and the locals that they would have perfect summer weather as soon as we left, and it appeared that our promise would be fulfilled. Because one of the most famous aspects of Newmarket during the summer is watching the horses — hundreds of them — walk from their stables around the town to The Gallops, acres and acres of rolling meadows on which the horses train every day, we drove straight to Newmarket and checked into our downtown hotel so that we could see the horses going to the Gallops early the next morning. Newmarket is generally considered to be the birthplace of thoroughbred racing (in 1174, so if there’s a better claim out there, they’ve had plenty of time to make it) and now is home to more than fifty training stables and sixty-plus breeding studs, in addition to seventy trainers and three thousand horses. One of the largest training stables at Newmarket is owned by Godolphin Racing, headed by the Ruler of Dubai, Sheikh Mohammed bin Rashid Al Maktoum. 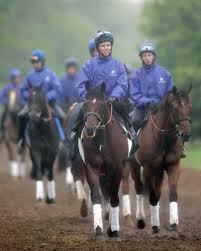 Godolphin’s distinctive blue racing silks are copied in the jackets of its exercise riders at the Gallops, as we saw. 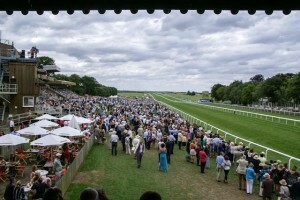 Racegoers from everywhere come to Newmarket to watch some of the best horses in the world compete on its two racetracks, the Rowley Mile and the July Course. We love English racing, not only for the pastoral beauty of the setting, but because all the races are run on the grass, on wide swaths of green, green turf that blanket the gently undulating race courses. 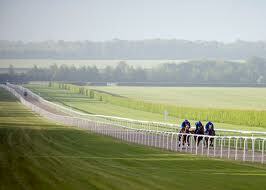 Some of the tracks have mile-long straightaways, which means that the horses don’t have to negotiate any turns. It also means that a field of twenty-plus horses in a race is common, since no one has to battle for an advantageous position coming out of a turn. Racing is mostly about the horses, of course, but the jockeys are the second most-important factor in this incredibly exciting sport. We know that racehorses are great athletes because we can see their conformation, their musculature, their gait, their temperament. 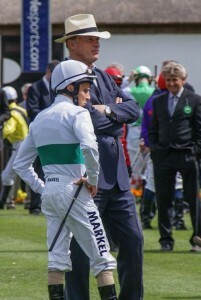 But jockeys are, pound for pound, the finest athletes in the world, in our opinion. A good flat-racing jockey (as opposed to a steeplechase jockey) might be just over five feet tall and weigh 115 pounds, but every ounce of that weight is muscle. And that small person has to control a 1,200-pound animal capable of running a mile in 96 seconds, using only his knees and hands, steering the horse out of traffic, not allowing the horse to use up its speed and stamina too soon, and staying aware of the position of every other horse in the race. And all this while balancing on his toes in the stirrups, bent low over the horse’s back but never touching the saddle. What these athletes do every day boggles the mind, especially considering the injuries all of them suffer during their careers. There are more and more women jockeys nowadays, as we’ve seen in the U.S. in races our own horses have entered, and they are just as strong and tough as their male counterparts. Before each race, the horses are saddled and led out into the paddock, where their owners are permitted to see them up close and where their trainers give the jockeys any last-minute instructions. Every track has its own unique paddock setup — for instance, at Ascot the paddock is almost like a show ring, with seating around the outside of its enclosure where spectators can watch. When the Queen has a horse entered in a race, she often goes into the paddock to talk with her trainer, which gives the rest of us quite a thrill. At Newmarket, the arrangement is much less formal, with the paddock set in a rectangle just beyond the finish line and viewing areas along both of the long sides. We like to get a closeup look at the horses before we place a bet on the race (not that we know much about what to look for), and then we make our picks. I look at a horse’s pedigree, past racing history, and recent workouts, and if all else fails, I choose the horse by its name, the color of its coat (I’m partial to greys), or the silks worn by the jockey. All very unscientific, of course, but sometimes it works. 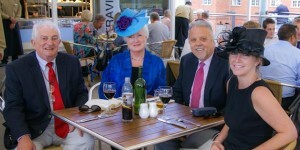 Before the races at Newmarket, the four of us (Jack and Sally McGill, Gerry, and I) had lunch at one of the restaurants at the track, where a woman at a neighboring table offered to take our picture. Sally and I wore hats, as did a few of the other women, especially the younger ones. We saw several quite attractive young women that day, including one spectacular-looking example of why you need a very good full-length, three-sided mirror to check all angles before you leave the house in a dress that forgives absolutely nothing. Luckily, she didn’t have a single bulge or blip to spoil the effect, and she was gorgeous, as well. I don’t think either Gerry or Jack even looked at the horses in the paddock for that race. Nobody came away a big winner that day, but everyone cashed at least one ticket, and we had a wonderful time. The weather was perfect, with sun and fluffy clouds and a light breeze, and the horses were all beautiful. Racing may be called “the sport of kings,” but we’re very glad that it’s outlasted most of the monarchies and has become accessible to everyone. Next, a brief look at historic Norwich and then on to Ipswich and “Constable country” and some of the English country houses in the eastern part of England. Vapour Musing, coming off a maiden win, was totally unimpressive in her follow-up, with the connections suggesting that she needs a longer race, and more maturity. Her pedigree suggests that she will do best running long races on the turf when she is older. A call from a TVI staffer urged us to keep the faith while this tall, rangy filly matures. OK! We will. Fifth Gear, a two-year-old colt, clearly hasn’t gotten the message yet, as he ran poorly in his second outing. The jockey said he heard the colt make a noise before he quit trying. A dynamic scope (a very sophisticated diagnostic tool for discovering breathing problems) revealed… nothing! And the management/vet explanation was that most two-year-olds have a sore throat now. OK again! We’ll keep the faith. Fifth Gear has run (or zig-zagged) to no avail in two starts, mouthing the equivalent of WTF? while seeing that other horses may be using his track. And then Matagot, who finished 8th in his debut at Saratoga on Saturday, August 4th, is clearly a “green” two-year-old who has much to learn, but whose connections are not as panicked as he was to find himself confronted by eight other colts tearing down the course. He raced without blinkers, which meant that he was easily distracted. Hopefully much better is in store for him. And finally, State of Play, the hard-luck story of 2011, fighting through multiple injuries and setbacks, appears healed, and is back in training. Time will tell whether this promising colt will be able to regain form and once again become a player. He is much too talented to be sidelined by injuries, and we expect him to be back in form very soon. In Lingerie ran a distant second in the GI $600,000 Alabama Stakes on Saturday, August 18 at Saratoga. Beaten 9 lengths by superfreak Questing — who ran 0.5 seconds off the track record at the 1 1/4 mile distance — she nonetheless was 8 lengths better than Zo Impressive in third place. She took home $120,000 for the effort. Next on her schedule is probably one of two races at Parx in Philadelphia on September 22: The Grade I Pennsylvania Derby or the Grade I Cotillion, each with a $1 million purse. A third possibility is the Grade I $500,000 Spinster at Keeneland on October 7. We weren’t able to go to the Black-Eyed Susan, so son Phil and his wife Robin, plus grandchildren Lindsay and Jacob, represented us in the owners’ box and the Winner’s Circle. Everyone had a terrific time, of course. If all goes well, In Lingerie will be pointed toward the Breeders’ Cup Ladies Classic at Santa Anita the first weekend of November, a Grade I $2 million race. Guess who’ll be there if she runs? As for Sweet Cat, coming off her March win at Gulfstream, she appeared fit and ready to run after a period during the summer when she spiked a fever and her training was set back a few weeks. She was entered in the Coronation Stakes at Saratoga on August 13, but clearly didn’t like the boggy turf conditions after days of rain and finished 6th of 9. She came out of the race well, and Todd Pletcher said, “Draw a line through it!” (as in, “pretend it never happened”). Her next race is as yet undetermined. 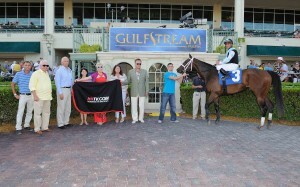 Vapour Musing won a maiden race at Colonial Downs in Virginia last week, and we were delighted. According to her trainer and our Team Valor managing partner, she gave a good acount of herself, but the race was really too short for her. They intend to run her at a mile and an eighth or longer, on grass, this summer at Saratoga. Her pedigree says that she will do better and better as she matures, and that she might be five (she’s now three) before she reaches her full potential. We’re just pleased that they haven’t given up on her and that they think she could have a future in racing. She’s very tall (sixteen hands-plus) and lanky, and still quite immature as race horses go, so we’ll have to wait and see. Fingers crossed! Fifth Gear is running at Presque Isle on July 3, his first race and intended to see how (or if) he breaks from the gate and deals with traffic. Young horses who have never trained with more than one or two other horses tend to come unglued when they find themselves in the gate with nine or ten or even twenty other horses. Let’s hope Fifth Gear has a calm, unflappable personality, as well as a whole lot of speed — the race is really a sprint on steroids — and that we’ll have good news to report after his race. The remaining fingers crossed! 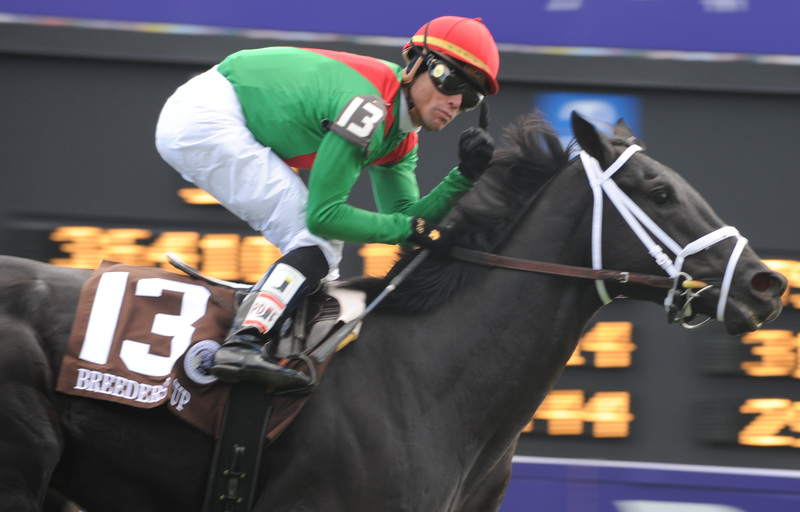 We know that many of you have been wondering about what is going on with Pluck, our beautiful black colt who won the Breeders’ Cup Juvenile Turf in 2010. He ran a couple of lackluster races in 2011 and was found to have fractured two cannon bones, an injury from which he recovered normally. Then he was entered in a race the day before the Breeders’ Cup in 2011, but that afternoon he developed colic, which is nothing like what babies get: his intestines became twisted, and if they had stayed that way for more than a couple of hours, he might have died. He was vanned to a veterinary specialist in Lexington, and emergency surgery was performed to unkink his intestines, barely in time to save his life. He made a good recovery, but it was decided to interrupt his racing career and look into sending him to stud instead. Two weeks ago, we were informed by our managing partner that the remaining 55% of the horse that our partnership owned had been sold to the Vinery Australia, the stable that bought 45% of Pluck right after he won the Breeders’ Cup. They love his daddy, More Than Ready, in Australia and are delighted to get our colt as a stallion for their brrodmare stables. We were sorry to give up our interest in him, but this is the best possible outcome for him. Our share of his winnings and his sale price has made it possible for us to continue to buy and own race horses, and we will always be grateful to him. He was our first real purchase (after a one-percent interest in six yearlings that got us into the game), and what a gift he has been! We thought you’d like to see some of the pictures we’ve collected of Pluck. Even if he hadn’t been such a great race horse, he would always have been the most beautiful horse we’ve ever seen. Let’s all wish him a long and happy life. 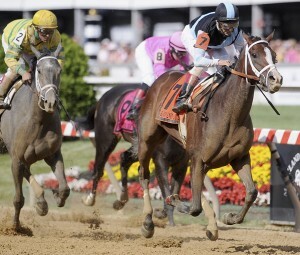 After stepping on her own feet and stumbling out of the gate, In Lingerie won the $300,000 Grade II Black-Eyed Susan at Pimlico on Friday afternoon with a flourish, defeating a field of eight other three-year-old fillies on a sunny day in Baltimore. We weren’t able to attend, since we’re only a week away from leaving on our long summer trip, but we were well represented in the Winner’s Circle by Phil and Robin and their two older children, Lindsay and Jacob. This was the grandchildren’s first racing experience, and we’re afraid that they will expect to be in the Winner’s Circle every time they go to the track from now on. We’ll have to explain that we won’t always have a horse in the race, much less a winner. The decision by the trainer, Todd Pletcher, and our managing partner, Aron Wellman of Eclipse Thoroughbred Partners, to pull In Lingerie out of the Kentucky Oaks and run her on Preakness weekend instead proved to be a wise one. Our filly was in perfect condition and had been training beautifully for the past weeks, so she was able to show what she could do under the right conditions, running on the dirt for a mile and one-eighth, a longer distance than she’d ever run before. Her next race might be the Mother Goose at Belmont, a Grade I Stakes race at a mile and one-sixteenth the day before the Belmont Stakes. In Lingerie is already rated the 11th-best filly her age in the country, and if she continues to perform at this level, she could well be named the 2012 three-year-old filly of the year. How exciting is that? 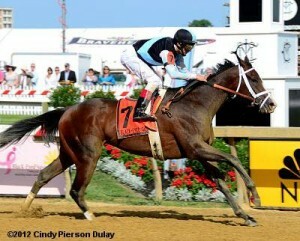 Meanwhile, here are some pictures from the Black-Eyed Susan, showing what a strong and determined race our filly ran. We couldn’t be prouder of her. The 2012 Derby is history and was fantastic or disappointing, depending upon your connections, or your bets. Cousin Kenny Rosenberg handicapped winner I’ll Have Another, and we reveled in the joy of our partners at TVI, who have ownership in fourth-place finisher Went The Day Well. He closed from a 17th place start to finish driving, and is a legitimate Preakness contender, coming out of the race with only an insignificant ( re: Graham Motion) leg cut. 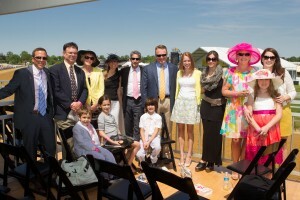 On the social scene, cousins Maxine and David Rouben, who graciously agreed to host us at their Louisville home for the Oaks, had a great Oaks Day perched in a box at the finish line, well out of the passing rainstorms. Devastated we weren’t there after our “In Lingerie ” was scratched. No word on their handicapping skills. 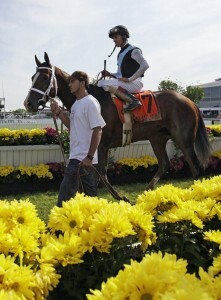 Rosie Napravnik, a female jockey, won the Oaks for the first time in history (see earlier post about Rosie). Where we are concerned, since we last reported, Vapour Musing finished third in a maiden race, contending in to the stretch, then appearing to drop the bit — picking it up again the last 1/16th, but falling short of a maiden win. You know that Sweet Cat finished second to a monster finish by Jazzy Idea on a very soft turf, and State of Play is, at last report,tentatively scheduled to run at Belmont on May 19. We are just back from a two-week driving trip to visit kids and grandkids in St. Louis and Washington, D.C. As you know if you read the previous post, our connections decided not to enter In Lingerie in the Kentucky Oaks tomorrow. She is not injured, but Todd Pletcher and our CEO Aron Wellman felt her last work did not warrant an entry in the Oaks, given the level of competition. The fourteen best fillies in the country will be competing in this “Run for the Lilies” the day before the Kentucky Derby. If our filly isn’t at her best, it wouldn’t be fair to run her against them. In the meantime, Sweet Cat ran yesterday at Belmont in a non-graded stakes for $85,000, and finished a non-threatening second, four lengths behind the winner, Jazzy Idea, and nearly two lengths ahead of the third place finisher. The speed of the race was an extraordinary 1:10 and change, and Sweet Cat earned $17,000. Still and all, she was widely expected to win, so the race was a disappointment overall. Further on, our third filly, three-year-old Vapour Musing, goes in a maiden special weight at Pimlico tomorrow in the 10th race, for a $31,000 purse. We don’t believe our connections have much confidence in her, echoed by her morning line fifth choice in a field of nine. BTW, of the six horses we currently own in partnerships, Vapour Musing and Fifth Gear (our new two-year-old acquisition with son Phil, who is just in training and has never raced), all of the others are Stakes winners or Graded Stakes placed. This includes Pluck, winner of the 2010 Breeders’ Cup Juvenile Turf; Sweet Cat, third- place finisher in the 2011 Breeders’ Cup Juvenile Fillies Turf; and State of Play, winner of the Grade 2 With Anticipation Stakes — who is recovering from stifle injuries. 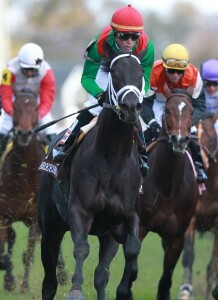 He is expected to run in the James Murphy Stakes at Pimlico for $100,000 on May 19, if his stifles heal. And last, but not least, In Lingerie, expected to run in the Kentucky Oaks, was deemed not ready at this time for the level of competition that the Oaks presented, and is instead pointed toward the Black-eyed Susan at Pimlico the day before the Preakness two weeks later, where the level of competition is expected to be less intense — although not to say easy. After a roller-coaster couple of weeks, it was decided today that In Lingerie won’t be running in the Kentucky Oaks on Friday. Although she has been training well and turning in good times, Todd Pletcher, our trainer, wasn’t entirely pleased with the way she finished this morning’s work. Following a series of discussions between Todd and our managing partner, Aron Wellman, the best plan for our filly came down to taking her out of the Oaks and entering her in the Blackeyed Susan at Belmont before the Preakness. They — and we — want her to have the best possible chance, and pitting her against a very strong field when she isn’t at the top of her game would have been unfair to her. She is very lightly raced, never having run until she was three years old, and will have a better shot at success this spring in a less highly-contested race than the Oaks. We’re a little disappointed, of course, because the Kentucky Oaks is the premier race for fillies in the country, and having a horse in that race is equivalent to having a Derby horse. But Gerry and I are in this game for love of the horses and not for the money or prestige it can bring if you’re lucky (and we’ve been incredibly lucky over the past three years). So whatever is best for our filly is fine with us. 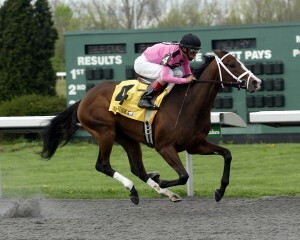 Meanwhile, here she is winning the Bourbonette Stakes last month, looking like the champion she is. We’ll keep you up to date on her career as she matures and develops. Well, phooey! Breaking from the number one post position, staying on the rail and out of trouble (as far as we could tell from watching the race on TV), State of Play turned in a rather lackluster performance in Friday’s $100,000 Grade III Transylvania Stakes on the turf at Keeneland. The winner of the race led from the first few yards out of the gate and really blew everyone else away in the stretch, but our colt stayed with him for most of the race, so we aren’t sure why State of Play ran out of gas. He finished a non-threatening third, good for $10,000 in purse money. Everything about this race pointed toward a good result for him: he prefers to run on the grass, and the distance (a mile and one-sixteenth) shouldn’t have posed a problem for him. Oh, well, as they say, that’s horse racing. And we’ve been incredibly lucky in our short career as partners in racing syndicates, not to mention the fact that we have a lot of fun in the process. Here’s a good photo of State of Play as a two-year-old, before he started racing. His sire is War Front, but he looks very much like his granddaddy, Danzig, the leading sire of the late twentieth century. Our colt is only three now, and he still has plenty of time to prove himself. Entered in a confidence-building maiden race at Pimlico this past Saturday, Vapour Musing failed to get the memo. She finished a lackluster mid-pack, never threatening, while going off the favorite at 5-2. While future plans are uncertain, TVI’s CEO Barry Irwin is known for quickly pulling the plug ( that is, selling the horse) on non-performers. We’ll keep you posted. Sweet Cat blazed to victory Friday over five furlongs on the turf, clocking a blistering 55-second time to come out on top of a ten-filly field at Gufstream Park. Her win was especially gratifying after her disappointing showing in February at the same race track, which made the trainer and the managing partner of Eclipse Thoroughbred Partners (the ownership syndicate we’re part of) wonder if our filly had lost interest in racing. That clearly isn’t the case, as she proved yesterday. 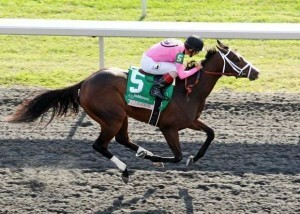 Her next race hasn’t been decided upon yet, but it might be a graded stakes race at Keeneland on the synthetic track. Or she might run in a stakes race on the grass instead. We’re very proud of her and thrilled that she is back in the game as a three-year-old.